A discectomy procedure is a type of surgery used to remove a small portion or the entirety of a damaged disc within the spine. 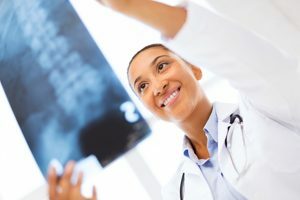 At Tahoe Fracture & Orthopedic Medical Clinic in Carson City, Nevada, we offer discectomy procedures to help patients recover from degenerative disc conditions or traumatic injuries that have caused a disc in the spine to become unstable. While many of these conditions can be treated conservatively without the need for a discectomy surgery, some patients do require surgery if the symptoms are worsening despite treatment efforts. At Tahoe Fracture & Orthopedic Medical Clinic in Carson City, we can walk you through each necessary step of your treatment journey, from conservative treatment to discectomy surgery and rehabilitation (if necessary). If you’ve been recommended for a discectomy surgery, it’s important to understand what to expect during your procedure. A discectomy is designed to remove the part of the damaged disc that is causing nerve root or spinal cord compression, which is often what causes the pain and symptoms associated with spine conditions. To do this, our surgeons will either remove a small section of the disc or the entire disc, depending on the severity of your condition. This decision will be discussed with you after your surgeon has reviewed your MRI and physical evaluation. For discectomy procedures that remove the entire damaged disc, implants will be inserted to restore stability to that area of the spine. If necessary, a patient may be recommended for physical therapy after surgery to help expedite the recovery process. To learn more about the discectomy procedures offered at Tahoe Fracture & Orthopedic Medical Clinic in Carson City, NV, contact us today.